All of us are sweltering now but it was not so long ago that big time snow was upon us! 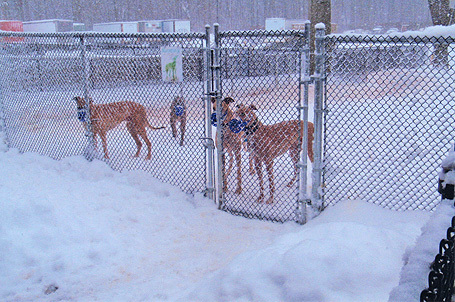 We had just moved into the new facility only months before and planned to put our indoor turnout areas to use if we couldn't get the dogs outside. As it turned out, we did not have to use them. We simply had to do one heck of a lot of snow removal using a uni-loader. It took about five hours of machine time after each snow to remove it from the runs and concrete areas. 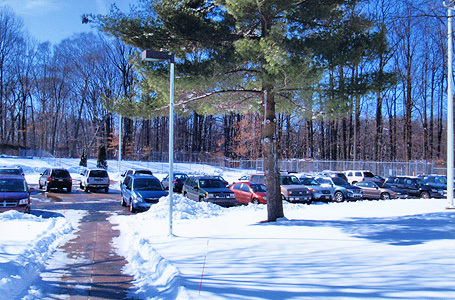 Snow mixed with sand and other stuff was piled high all over the parking lot and took weeks and weeks to finally melt. Some of the dogs absolutely loved running in the snow. Others made their trip outside short. Don't worry. Winter will be back again.